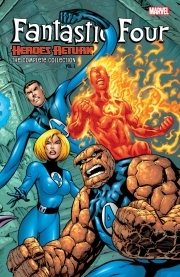 The Fantastic Four make their heroic return to the Marvel Universe -- courtesy of comicbook heavyweights Scott Lobdell, Chris Claremont, Alan Davis and Salvador Larroca! And old enemies lie in wait, including the Mole Man, the Red Ghost, the Trapster, Ronan the Accuser, the Frightful Four, Terminus and Crucible! But what does the bizarre Technet want with Franklin Richards? And where does the Captain Britain Corps stand on the matter of Reed and Sue's son? Plus, the Human Torch and Spider-Man, together again! The Scottish savior Caledonia debuts! Iron Man strikes! Franklin gets a puppy! The Thing deals with multiversal madness! And Adam Warlock's opposite number, the one known as Her, returns! It's an exciting and action-packed era for the FF, collected for the first time!